The Red-headed Quelea was formally described by Karel Johan Gustav Hartlaub, a German physician and ornithologist. Carl Weiss, a German collector, was the first person to obtain specimens of the Red-headed Quelea (together with other bird specimens, including the Sao Tome Weaver) for The Hamburg Museum. He travelled from 1847-1850 on the ship Adolphus to Sao Tome then to the coast of Ghana, to Principe and back to Sao Tome again. He probably collected the Red-headed Quelea soon after arriving on the island, and sent back many bird specimens which Hartlaub was able to describe in 1848 and later. 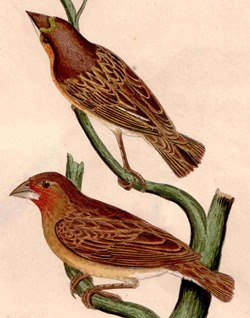 The first illustration of a Red-headed Quelea is a colour painting published by Hartlaub in 1850. The second illustration was published by Reichenbach 1863. Ploceus erythrops	Hartlaub 1848	Rev. Zool. 1848 p.109	Sao Tome. erythrops - Greek. Eruthros, red; ops, the eye, the face; refers to the red or rufous face. 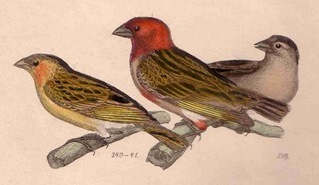 The red-headed Dioch (Reichenbach 1863). Pokerhead, Red-headed Dioch, Red-headed Weaver. One type specimen is in the Zoological Museum at the University of Hamburg, and specimen UMB - 5281 is in Ubersee Museum Bremen. Identification. The Red-headed Quelea is a small weaver found in scattered localities through Africa. The male in breeding plumage has a bright red head, closely resembling the Cardinal Quelea but the Red-headed Quelea has the red of its head continuing onto the nape but not onto the breast, and has black barring on the throat. The female is very similar to the female Cardinal Quelea, with a yellowish face and supercilium, but has a white throat, short dark moustachial mark, slightly larger and paler bill, but is probably not safely distinguishable in the field. The non-breeding male may retain some red on the head. Read more about its identification in South Africa here. Distribution. The Red-headed Quelea occurs widely through sub-Saharan Africa (see map left, based on Birds of Africa). Two races have been proposed previously, Q. e. erythrops in the north and Q. e. viniceps in the south, but the species is currently treated as monotypic. Morphological differences between these races are slight, but there may be differences in the timing of moult, migrations and breeding in the two regions which suggests separation with minimal interchange between these populations. Habitat. 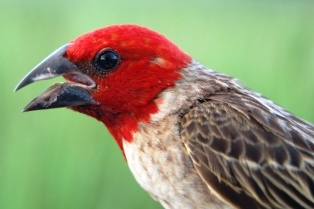 The Red-headed Quelea inhabits rank grass near water, tall grassland, farmland and rice fields. It is highly gregarious, often in flocks of over 1000. Small groups join mixed-species flocks of weavers. Flocks are restless, some birds feeding on the ground, and others perching in bushes. Food. The diet of the Red-headed Quelea consists of grass seeds, and insects. Rice is taken, and it may be a pest in some areas. Nestlings are fed on insects. Breeding. The Red-headed Quelea is probably polygynous. It is colonial, with several hundred nests close together. The largest colonies consist of 3000-5000 nests. Breeding is highly synchronized. Males may leave the colony before the young fledge. Colonies are seldom at the same site in successive years. The nest is a tightly-woven dome with a side entrance, built from very narrow strips of grass. The entrance is oblong, without a porch, but with a small platform on the lower lip. The nest is not lined, and is suspended between 2 grass stems, above water in reeds. Males and females have been recorded as building nests. Eggs (1-4) are uniform pale blue. Incubation is by the female and clutches usually hatch in tightly synchrony in a colony. Movements. 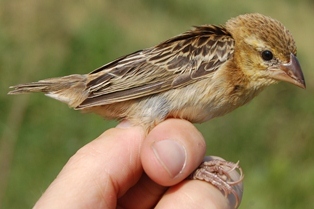 This species is migratory but few recaptures or recoveries have been reported. The greatest movement to date is at least 475 km and the details of this record may be seen here. 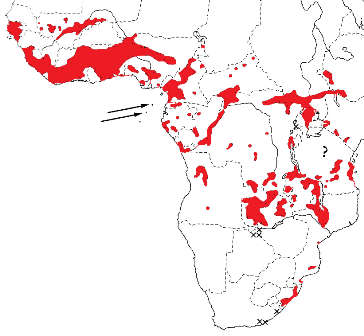 Red-headed Quelea, Range-change map between SABAP1 (1987-1991) and SABAP2 (2007-current). 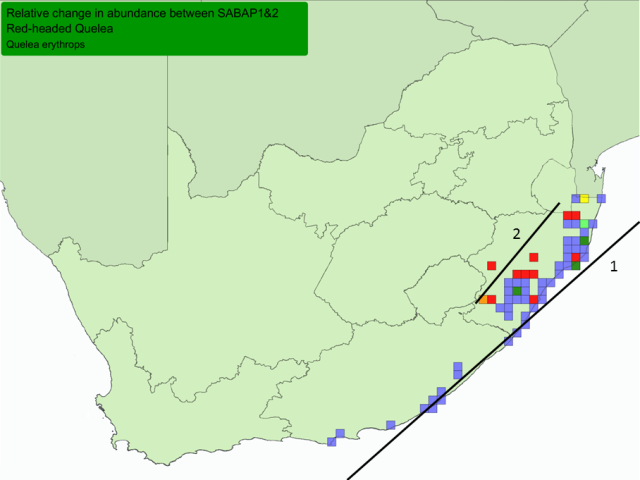 In South Africa the Red-headed Quelea has many more grid cells with increases in reporting rate than cells showing decreases, between SABAP1 (1987-1991) and SABAP2 (2007-). 1. Along the eastern coast of South Africa. 2. The interior edge of its range in KwaZulu-Natal. The Red-headed Quelea occurs at a low density in southern Africa. 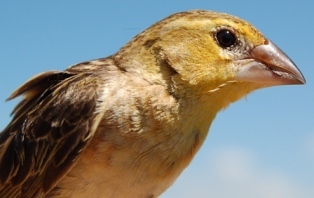 During SABAP1 the Red-headed Quelea was not recorded in the Eastern Cape, but there had been many records prior to SABAP1. Botswana: new arrival (Tyler 2008a). Chad: seen near Mongo, unusually far north (Demey 2015b).